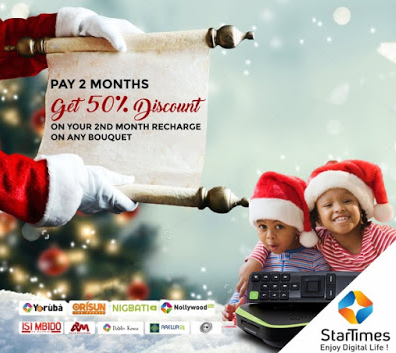 Christmas is just few days away and lots of promos are already flying in the air … Leading digital Paytv Company Startimes has announced a 50% discount off subscription rates, in a bid to entice the existing subscribers across the country. Subscribers who renew their subscription for two months on any bouquet will automatically get a 50% discount on their 2nd-month subscription. This offer will run from Dec 1st to January 31st 2019. If you’ve gotten Jolly decoder from tstv kindly let us know. Very Good for startime users. DSTV go soon drop theirs..
Where is MTN promo, GLO promo, AIRTEL promo etc.